My name is Ellenore. I'm 21 years old, single, and live in Arizona. I'm enrolled in an introductory psychology class. My professor says that all human beings act out of a selfish motivation and that even when a person appears to be doing something altruistic, that there is a self-serving payoff behind every apparent good deed. Please enlighten me on the topic of selfishness and narcissism, and the possibilities of having pure compassion and selfless charity? 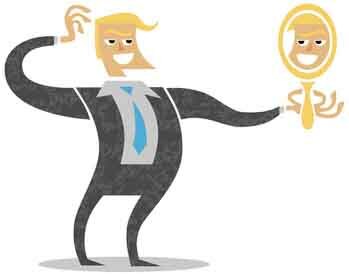 Related Articles: What Causes Narcissism: Can Extreme Selfishness be Overcome? Yes, we all struggle with selfishness to one degree or another. There are times in everyone's life when they put "ME" in the center of their world. In this life, it is possible for a person to act from pure compassion, with no underlying motivation of a selfish payoff. For example, consider parents who do many things for their children simply out of love for them. Indeed there will be parents who "live through" their children, and their generosity is a selfish investment into what the parent expects to get back through the child. "In the mean while his disciples prayed him, saying, Master, eat. But he said unto them, I have meat to eat that ye know not of. Therefore said the disciples one to another, Hath any man brought him ought to eat? Jesus saith unto them, My meat is to do the will of him that sent me, and to finish his work. . . . For I came down from heaven, not to do mine own will, but the will of him that sent me." The Apostle Peter invites believing Christians to walk in His ways, "that ye should follow his steps." **Selfishness is really self-destruction in slow motion. Our great fulfillment in mortality is realized as we not only bury every selfish urge, but completely annihilate them. Hence annihilation, not moderation, is our best destination! Surging selfishness has shrunken some people so small that they seek to erase their emptiness through sensations — selfishness has an insatiable appetite for every expression hedonism: the pursuit of profit, pleasure, promotion, power, prestige, and property. But in the arithmetic of egocentric appetite, anything multiplied by zero . . . still equals zero! Each spasm of selfishness narrows the possibilities of human joy that can be felt through acts of pure charity. Selfishness reduces one's awareness of and empathic concern for others. In spite of its glamorous swagger, indulgent individualism exists in a shallow and ungrateful world: Selfish hedonists are like goldfish in a bowl congratulating themselves on their self-sufficiency — never mind the food pellets or changes of water supplied by He who showers abundance blessings unto the grateful and ungrateful. 6) Taking advantage of one because of his words. By focusing on themselves, selfish people find it easier to steal, bear false witness, and covet, since nothing should be denied them — getting what they want is the driving lust of life. No wonder it is so easy for governments to pander to the appetites of selfish people. The promise of something for nothing is the lure of some liberal leaders (but free benefits must necessarily be paid by someone). The cure for narcissism centers in the acquisition of the Christ-like characteristics of Humility and Charity. Striving to live life charitably and humbly does not merely mask selfishness but makes it completely disappear. Small steps toward with a humble heart full of charity — the charity that seeks not its own — are taken by inwardly asking: "whose needs am I really trying to meet?" The unselfish live more freely. G. K. Chesterton said, if we can be interested in others, even if they are not interested in us, we will find ourselves "under a freer sky, and in a street full of splendid strangers" (Orthodoxy , 21). There will be no spouse or child abuse when there is unselfish love at home. Diligently doing ordinary acts of service for others, helps us overcome selfishness — and the inner glow of joy we feel when serving others is the natural consequence that says: "This feels good, keep walking the unselfish way!" 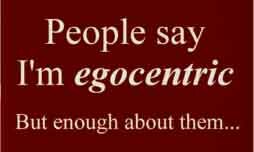 Egocentric concern is the detonator of all betrayals of truth. Narrow-minded narcissism is the hammer for the breaking God's Laws: whether by neglecting parents, the Sabbath, or by inducing false witness, murder, and envy. No wonder selfish individuals are often willing to break a covenant in order to feed an appetite. Some of the selfish wrongly rationalize that there is no Divine Law anyway, so there is no betrayal of truth. Situational ethics are made to order for the egocentric. Unsurprisingly, selfishness leads to terrible perceptual and behavioral blunders. For instance, Cain, corrupted by his seeking of power, said after slaying Abel, "I am free" (Moses 5:33; 6:15). One of the worst consequences of severe selfishness, therefore, is this profound loss of proportional perspective — like straining at gnats while swallowing camels (Matt. 23:24). Today, there are those who strain over various political gnats but swallow the practice of partial-birth abortions. Small wonder that this kind of selfishness makes 30 pieces of silver look like a large treasure. Determined to walk in his own way, the narcissistic man often persists to the point where his conscience is unresponsive and numb — the Bible calls such extreme self-absorption, being "past feeling" (Eph. 4:19). Like a drug addict, the narcissist needs a fresh fix to sedate any sense of obligation toward others. The severely selfish use others but do not love them. The prophet Jacob warned selfish men, "Ye have broken the hearts of your tender wives, and lost the confidence of your children, because of your bad examples before them" (Jacob 2:35). When selfless love goes cold, let the poor and the needy beware too, for they will be neglected as happened in ancient Sodom (see Matt. 24:12; and Ezek. 16:49). Even early droplets of selfish decisions suggest a direction: little rivulets come, merging into small brooks and soon into larger streams; finally one is swept along by a vast river which flows into the "gulf of misery" (Hel. 5:12). Gross egocentrism leads to societies without order, without mercy, without love, perverted, and past feeling (Eph. 4:19). Cultural decline is accelerated when government lobbyists push special-interests, and through this self-serving process the general values and good of the people are pushed aside. Selfishness causes us to be discourteous and disdainful, while withholding from others needed goods, praise, and support. This narcissistic drift is facilitated by the narrow-sighted indifferent of a selfishly indulgent society. In place of some traditionally shared values, is a demanding conformity pushed by those who eventually and ironically will not tolerate those who once tolerated them. Such are the consequences of selfishness. For what happens in cultural decline both leaders and followers are really accountable. Historically, it is easy to criticize bad leaders, but we should not give followers a free pass. Otherwise, in their rationalization of their degeneration they may say they were just following orders, while the leaders say we were just ordering followers! Much more is required of followers in a democratic society wherein individual character matters so much. A visionary leader like Lincoln warned of how individuals of ambition would arise and that such "thirst and burn for distinction, and if possible . . . will have it, whether at the expense of emancipating slaves or enslaving freemen" (cited in John Wesley Hill, Abraham Lincoln--Man of God , 74). Of unselfishness it has been written: "In all history few men who possessed unassailable power have used that power so gently and self-effacingly for what their best instincts told them was the welfare of their neighbors and all mankind" (James Thomas Flexner, "Washington: The Indispensable Man" , xvi). Power is most safe with those, like George Washington, who are not in love with it! A narcissist society, in which each person is busy looking out for number one, can build neither brotherhood nor community. Aren't we glad that Jesus did not selfishly look out for number one? No wonder the Bible established from the beginning: "Thou shalt have no other gods before me," (Ex. 20:3) and this includes self-worship! One way or another, the grossly selfish will finally be shattered, whimpering, against the jagged concrete of their narrow narcissism. May selfless Humility and Christ-like Charity be our path too, for it is the pathway to peace, and the joyful bonds of love one to other. Making the transition from Selfish Hedonist to having a Humble Heart is thoroughly explained in my book, Changing Your Stripes. ** Most of the Ideas and Words in this article are inspired by, and borrowed from, the late Neal A. Maxwell and his eloquent sermon on Selfishness (April, 1999).